We’d love your help. 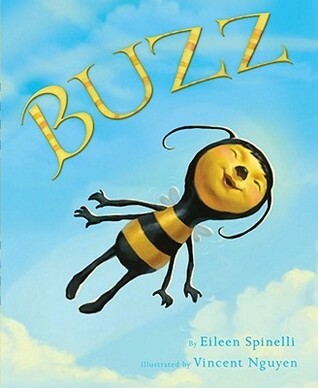 Let us know what’s wrong with this preview of Buzz by Eileen Spinelli. To ask other readers questions about Buzz, please sign up. I picked this book up because of the illustration on the cover. It was the best of the illustrations and while I love the quote upon which this book is based the story was just okay for me. 3. Review: This book's tell shows the fall from identity, and the self-talk and courage it takes the believe in yourself. I gave the book 4 stars because the beginning went into great detail naming all her friends, and then made the fire climax rather abrupt. If it had featured a self-reflective ending, I may have given it five stars! Despite a predictable and somewhat sacchrine story line, some of the illustrations here are so full of life and personality that I wanted to keep them forever. I'm giving away the ending here so skip this paragraph if you're sensitive to that: Cute book about a bee who read in the news that bees can't fly and, just like an episode of hysterical blindness, all of a sudden loses her ability to fly. This continues until her help is needed in an emergency and she saves one of her friends. The end. I put this in lapsit because I think the pictures are bold and clear enough to read with a baby. And I put it in self-help because of the overall message: Learni I'm giving away the ending here so skip this paragraph if you're sensitive to that: Cute book about a bee who read in the news that bees can't fly and, just like an episode of hysterical blindness, all of a sudden loses her ability to fly. This continues until her help is needed in an emergency and she saves one of her friends. The end. Buzz is a hero! I wish I had this book when I was discussing "Hero inside of me" Poor Buzz reads part of a newspaper article (half is missing) by a Professor that says Bee's can't fly. Buzz loves to fly and it breaks her heart to find out she can't fly. But she finds out she can and she saves the day! Stand up for yourself, and do things people say you can't! If it doesn't hurt anyone else, be the best you!! BUZZZ!!!! A beautifully illustrated book about believing in yourself, even if others don't. It is a little long to read cover-to-cover with a pre-k or younger group, but I've found that I can paperclip a few pages together and hop right over them without cutting into the story. I've read this for a few pre-k and younger storytimes, and the kids seem to like it. There are plenty of opportunities to ask them questions about the book and move the plot forward while skipping over some of the text. He LOVES this and has had to read it twice a day since we borrowed it from the library. Overall, I like it, too, but the bee illustrations creep me out a little (why is her face so human? This isn't the case with other animals in the book) and I'm not sure Jonah (age 4) gets the gist of what happened to make the bee think she couldn't fly. Still, I love that the protagonist is female, and the story has a sweet message. I thought the illustrations were cute. Funny how people and bees will believe what other people tell them, over reality. This poor little bee read that aerodynamically bees should not be able to fly. Then all of a sudden Bee couldn't fly! Fortunately she learns that she really can fly no matter what others say. Buzz loves everything about being a bee, especially flying. But one day she reads a newspaper clip that explains why bees can't fly and, taking to heart what she has read, she loses her ability to fly. It's not until she has to save a friend that she recovers from her loss of confidence in her own abilities. This book provides a great lesson for anyone who works with children. I liked the illustrations better than the writing. The story was okay, but pretty predictable. Also, I ended up liking the snail better than Buzz the bee. But, yeah, the oil painting in the illustrations gave them a richness. The size of them also could make this a decent selection for story time with 4-8 year olds. This bee loved to fly but when she read a partial article that stated bees could not fly, she immediately could not! Only when a friend needed saving did she rediscover her wings. Kind of reminded me of Dumbo! Buzz the bee loves to fly and stop to visit her friends to tell them of her flying adventures. Until one day she reads an article that says bees can't fly. What will happen when her friend the owl needs her to fly to save him? Can bees fly? Preschool for length. Recommended to Relyn by: I love Eileen Spinelli. I didn't love this book the way I do many others by Eileen Spinelli. But, I liked it. I also think it would be a great discussion starter for believing in yourself and not listening to anyone who tells you that you can't. Buzz is a bee. Her favorite thing to do is to fly. One day while she is flying a gust of wind blows a scrap of newspaper from under a bench. The headline stops her in her tracks..."Bees Can't Fly" and suddenly, she falls plip to the ground. But a fire helps her find her wings again. Good for storytime. Friendship. Narrative? My boys love insects and this is a cute story about a bumble bee. A good moral to teach any kid about never giving up no matter what anyone tells you. I like the aspect of the expert making the bee question her ability to fly. It could be a help in introducing questioning to young students. Such a sweet children's book with beautiful illustrations. Did this story really need an article from a professor? I understand but I think the execution is lacking. Nicely illustrated with a cute plot, but would need to be contextualized when used with children.